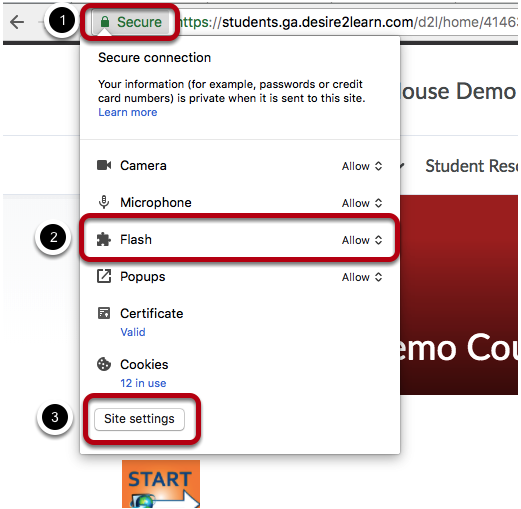 Enabling Flash on Browsers - Georgia Department of Education. All rights reserved. Follow the directions below to find out how to ensure you have set your Adobe Flash settings. 1.In the web address, you will select the lock or the "i" to the left of the address. The secure connection will appear with what your browser is allowing as indicated in the picture. 2.Check to make sure flash is allowed. You may need to select allow for it if it says something different. 3. 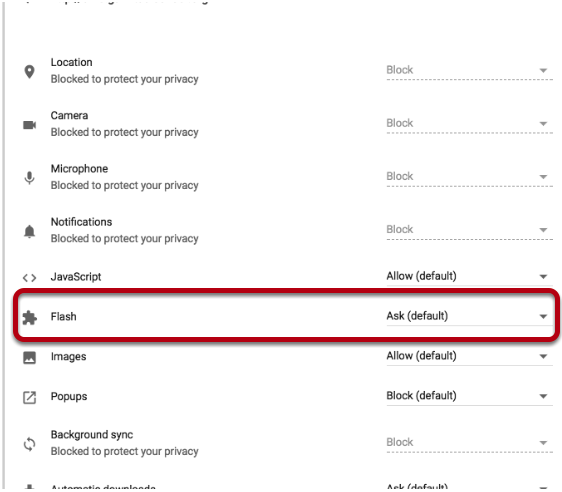 If flash is not listed, you will want to select site settings. When going into site settings you will need to set this to allow as seen in the next image. Once you have set this to allow, you then be able to go back to the previous tab and reload the page. Once you reload the page, the new setting will take in effect allowing for the flash material to be seen. If you cannot see everything, you will want to select the i next to the web address so you can adjust the Adobe Flash settings for the site. You will need to Allow Adobe Flash by selecting it. You will want to toggle for it to be on if it says off. Once you have done this, you will need to refresh the page for the settings to take place. Once you have refreshed the page, you will see the words appear. In the web address, select the block to the left of the web address. Select to allow and remember the Adobe Flash setting. Once you do this, the page will automatically reload and the items will appears.